By the age of twenty-seven, Danell Lynn had been married, divorced, collecting university degrees, developing fashion companies, traveling the world and learning that you can definitely go your own way. 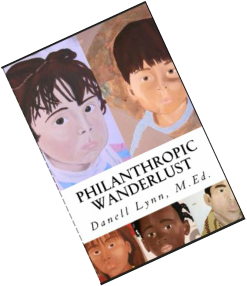 Philanthropic Wanderlust will open new windows of possibilities into the magnificence of globe-trotting, the need to explore and understand cultural diversity. 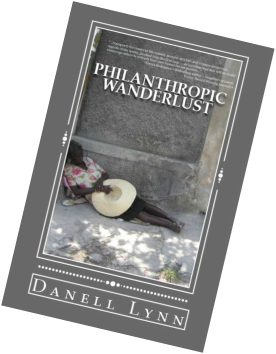 This story using humor and heartache, illustrates the burning desire of one woman for compassion, fueled by wanderlust and a giving spirit that shines brightly. Chronicling five years of travel and philanthropy, celebrating life and the freedom to go beyond the unknown and take a passionate step out of “comfort zone” life acceptance, Lynn delivers the ultimate adventure…the adventure of living. Finding laughter and fear from the northern mountains of Ecuador to the deserts of Morocco, from AIDS hospitals in Malawi to pediatric units in Haiti, darkness and death in El Salvador to the rhythms of life in Cuba, and one can’t forget the “luck” of feces in Colombia. explore the world and her people, live out loud!" Exclusive through this website only. Collector’s set comes with the Advance Reader Copy mini-book, the First Edition (now out of print), and the 2nd edition (the currently active edition of the book). 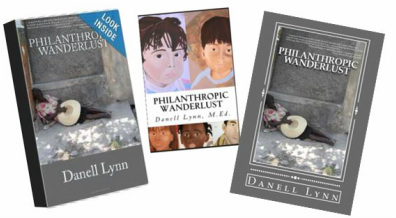 Be a part of the process from start to finish of Danell Lynn’s first book! These can come with personalized inscriptions, or just as signed copies it is up to the collector. Get all three for just $50.00, interested…contact the author directly through the contact page and let her know who you would like them signed to and she will send you a Paypal invoice for the purchase.